In my continued attempt to depress the hell out of myself during the holiday season, I caught the early showing of this movie this morning. The film won two awards at Sundance (thus piquing my interest in it...), including one for screenwriting. Inexplicably because, while John Cusack creates a magnificent portrait of a man who must tell his two daughters that their mother was killed in Iraq, the story felt awkward and contrived at times. 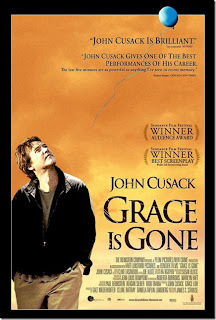 Cusack, however, convincingly conveys the agonizing burden and numbing grief as he tries to give his girls one last happy memory before breaking the bad news to them. But the plot is disjointed and rambling--starting with the quick snippets that define Stanley Phillips' life--his job as a manager at a Home Depot-like store, his reluctance to participate in a military spousal support group, the mundane routine of being a single parent. There was plenty of material to be explored in being the sole male member of among military wives--sadly it was limited to one short scene. Speaking of credits, I was surprised to see both Marissa Tomei and Mary Kay Place credited with small non-speaking roles that you would miss by blinking. What was up with that? Was there a shortage of extras? The most surprising credit, however, was Original Music by Clint Eastwood. Despite having 22 credited producers (including Cusack), the film retains a low-budget indie feel--especially the sometimes blurry camera work. It's out in limited release, but that's OK. I suggest waiting and Netflixing it when it gets released to DVD.